Flobot was built around the need for visibility. The need to see what is going on inside your business at any time in the past right up to this very instant. And that's why everything can be exported to a csv or excel file in any screen. Every bit of data collected can easily be shared and interrogated by the statistically minded. But for those who really just need a high level view of the business on a daily and monthly basis there is the dashboard - designed to guide the user and help them see where actions need to be taken in the workflow and interventions made - reminders for ordering materials for example. Not just profit and loss - Flobot's reporting features are built in to everything you do, and aren't hidden in a confusing reporting section unlike most software. Want to see how many calls your team have each handled this month? No problem - it's just a click away. Want to see how much money you've made this month? Just navigate to your financial home page, and it's all there in an easy to use, at a glance format. The dashboard gives you a quick guide to the state of your business at this moment in time. And that means a high level view for the owner or a view specifically for a telephone operator taking calls and anyone inbetween. When you're running a service based business it's essential to know just how much money you're making on every single job. 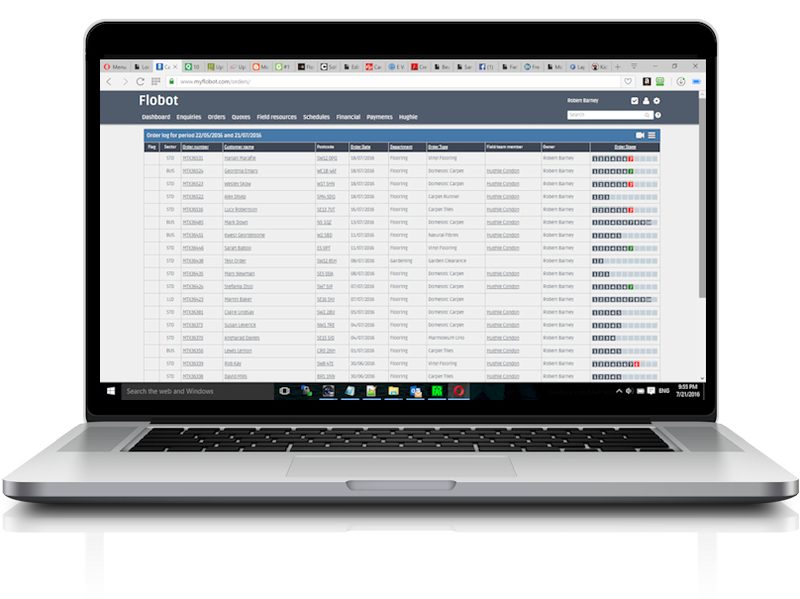 Flobot enables you to see exactly what is going on in real-time by allowing you to add costs to a job, such as labour, materials costs and sundries. It means that you are in complete control of every job and not just using best guesses to work out your costs. You need to know how your whole team is performing and Flobot gives you visibility of your office staff as well as your field team. Every team member can be managed on their performance with 'at a glance figures' on a whole range of measures such as profitability, number of orders handled and number of quotes converted. You can also see how many appointments your field team have met, how any were missed and a a whole host more. Sometimes you want to use third party software to analyse your data and Flobot can export all of your data straight across to most major accounting packages such as Xero and we're adding new integrations all the time.